In Shares Magazine, November 2013. Original article. Wine, stamps, gold bars and other real assets have historically kept their value well amidst economic turbulence and inflation. And they have never been easier for private investors to trade. At first glance, it seems a Picasso would have been a better investment than the FTSE100 over the past decade. Art as an asset class grew by 183%, compared to a 55% rise in the market in the ten years to July 2013, according to the Knight Frank Luxury Investment Index. In fact, most so-called real assets such as wine, stamps, vintage cars, jewellery and physical gold, all beat the market in this period, providing a decent hedge against economic instability and inflation. Once the purview of specialists only, alternative assets are becoming increasingly accessible to retail investors. Custom trading platforms are making the process more transparent and streamlined: GoldMadeSimple and BullionVault are online investment services where investors can buy and sell gold bars that never moves from a secure storage location as ownership changes. 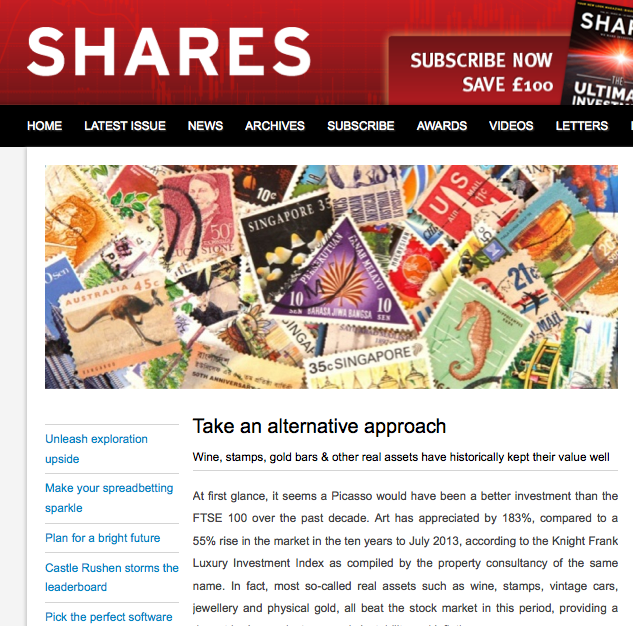 Liv-Ex and Wine Owners provide similar services for fine wine, while Stanley Gibbons enables investors to build and trade portfolios of stamps. But just because stamps as an asset class grew by 255% in the past decade, that does not guarantee all stamp collectors saw a positive return. Real assets are high risk, with the lack of regulation, poor liquidity and high commissions. And then there’s the specialist knowledge: knowing the difference between a Bordeaux and a Shiraz is no longer just about complementing dinner, but knowing which will be the moneymaker in the cellar. “It is not as simple as the FTSE100, where anyone can buy in and pay a moderate fee. Wine, stamps, and collectibles are investments of passion, so if you are not going to enjoy them, do not buy them,” says Andrew Shirley, head of rural research at Knight Frank, the property consultancy. Shirley compiles the Luxury Investment Index for the annual Wealth Report. Motivations tend to be mixed, however: while coins and stamps come with the pleasure of ownership, they are also an investment. “There has been a lot of interest in some of these assets in recent years from emerging markets, in countries which have seen a lot of wealth creation. Asian investors have been spending a lot of money in the art world, and especially Hong Kong and Chinese investors have been buying a lot of expensive wine. It has all had an effect on pricing,” says Shirley. The Wine Passport is Wine Owners’ push to improve transparency in this market, by attaching complete records of source, movement, inspections and other details relevant to each bottle. This is reassuring for an asset where one dodgy transport could see the product ruined by being left in the sun too long. “Top wines have a pretty long shelf life, and will keep from 20 to 70-plus years. But they are a living product and will hit a plateau of maturity,” says Martin. HRMC classifies wine as wasting chattel, meaning private investors are exempt from capital gains tax. Having gained 430% in value over the past decade, vintage cars owners were the winners in Knight Frank’s index. But more obscure assets can also be surprisingly profitable: for instance, the 40 most sought-after autographs have gained an average of 13.6% per year since 2000, according to the PFC40 Autograph Index from Paul Fraser Collectibles, the specialist trader of investment-grade collectibles including stamps, wine and coins. Wade warns potential investors to watch out for fakes, and not to be impressed simply by certificates of authenticity. “Buy from a dealer who offers a lifetime money-back guarantee of authenticity. This will give the assurance that what you are buying is the genuine article.” And do not be afraid to ask lots of questions, concludes Wade; after all, wine buffs and stamp geeks love to talk about their favourite investments. As the world’s largest investment service for physical gold, BullionVault now services 50,000 people globally who own more than 32 tonnes of metal between them. Trading takes place 24 hours a day. “We plug you into the wholesale market. That means whole bars, so think ‘The Italian Job’, think ‘Goldfinger’,” says Adrian Ash, head of research at BullionVault. Investors will unfortunately not be handling their bars like a Bond villain, as their metal is kept in specialist vaults in Zurich, London, New York, Toronto or Singapore. “The choice of location is important. If the economic situation deteriorates, or a government tries to bring down the shutters on capital flow, this is one way of keeping some of your wealth outside of that,” says Ash. While the appeal of the yellow metal as a hedge against turmoil and inflation is well-documented, companies like BullionVault have made it much easier for private investors to tap into these benefits directly. “Gold is an incredibly deep, liquid market in a way that fine wine is not. Gold is gold, it is a chemical element that does not even rust. It requires very little care,” says Ash. Posted on 11/23/2013 by Jess. This entry was posted in Investment and the market and tagged alternative investments, art, gold, investing, shares magazine, stamps, wine. Bookmark the permalink.